Though there are several La Jolla hikes that we love, one of the area’s best-kept secrets is tucked away down a small side street atop Mt. Soledad. 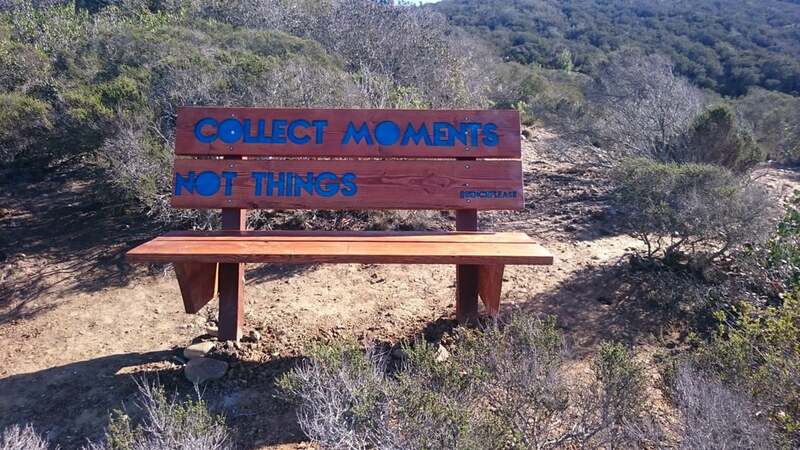 Also referred to as La Jolla Natural Park, La Jolla Heights Open Space is a small 42-acre preserve that was set aside to preserve its sensitive biological resources and habitats. Within the preserve, you’ll find a hidden trail that hugs the coast and leads to sweeping panoramic views of the Pacific Ocean, downtown San Diego, and even Mexico on a clear day. It’s a short hike that makes for a fun and easy weekend outing; and at a little over a mile out and back, offers incredible rewards for little work! Heading south on Torrey Pines Road, towards The Village, turn left onto Exchange Place. You can park to the right on Virginia Way or Olivet Street. Now on foot, keep left onto Soledad Avenue when Exchange forks off. Go right from Soledad Ave onto Al Bahr Drive. Continue on Al Bahr under the bridge; the trail begins at the farthest end of the street loop, marked by a brown trailhead sign. The short trail winds its way through thick vegetation and a good deal of San Diego’s native chaparral. Keep an eye out for wildlife, especially if you’re hiking closer to sunset; people have spotted all kinds of creatures, including gray foxes, bobcats, brush rabbits, lizards, gopher snakes, and scrub jays. After passing through some tall grass, the hike opens up to an expansive desert hillside covered in chaparral. There are several clearings up the hill that provide incredible photo opportunities; the views of La Jolla just get better with each step. There are a few forks in the path, but as long as you continue on an uphill branch, you’ll eventually reach the summit. 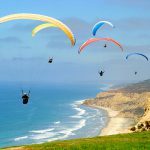 On super-clear days, you’ll even be treated to views of La Jolla Shores, Torrey Pines State Reserve, and Catalina Island! Once you’ve taken in the views, head back to Encelia Drive, past the car gate, and continue south to reach the intersection of Encelia and Brodiaea Way. Turn right onto Brodiaea and make your way down the hill; turn right again on Romero Drive, which will become Country Club Drive. When you reach Exchange Place, you can continue down to Torrey Pines Road or turn right onto Soledad Avenue to make your way back to the trailhead at Al Bahr. The roundtrip hike, up the hill and down the streets back to the trailhead, is approximately 1.3 miles and takes around 50 minutes if you stop for a few photos and sit on the bench at the top to admire the view. There are few trees to provide shade, so bring sunglasses, sunscreen, and plenty of water on warmer days. Elevation gain is roughly 655 feet. It’s rustic. 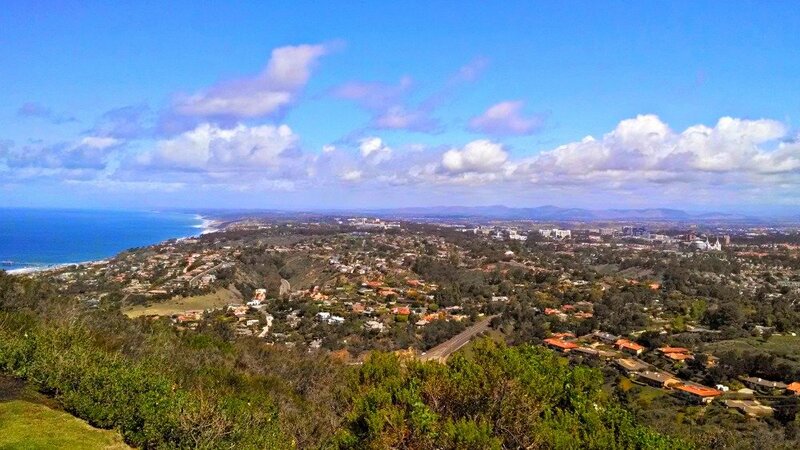 La Jolla Heights Open Space/Natural Park provides one of the only more rustic and naturally beautiful hikes in the area. Although it’s maintained by the City of San Diego, much of the flora and fauna grows wild, providing hikers with a rare glimpse into the rougher, unmanicured parts of La Jolla. No other hike in La Jolla provides 180-degree views like this; and the cute bench to take it all in from is just the cherry on top. Clocking in at just over a mile, the hike is long enough to be a workout but short enough to not take you all day to complete. Less work and more rewards? We’ll take that combo any day! The ascent is steep and most of the path is dirt, so wear your hiking boots or tennis shoes! 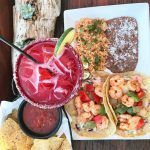 After your hike, you’ll find that you are close to many restaurants in the La Jolla Shores area. 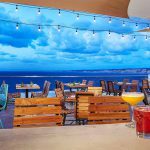 Head to Galaxy Taco or Shorehouse Kitchen for a more laid back lunch, or travel a bit further to Caroline’s Seaside Cafe, atop Torrey Pines, for more awesome views and an outdoor patio. There are so many unique La Jolla hikes and trails! Which one is your favorite? If you reside or work in La Jolla, you run around here with a to do list of important business and errands. Taking a break with a latte is time you need to rejuvenate…and caffeine to help get back to your bustling schedule! And hey, if you’re on a vacation, taking a breather from sightseeing mode to relax and have some energy-boosting goodness is just as vital. Stroll up to this spot and feel the bustle before you even see it. This small cafe is always packed with loyal customers, reassuring you it’s going to be amazing. With the feel of a classic European cafe, you’ll hear regulars rattle off an order of a latte and a pastry. Everything is good, but the scones are the most famous item; more than 100,000 here are sold each year! Lunch is served starting around 11 am. If you have time to sit and really revel in your food, grab a table at the outdoor seating out in front below the cafe’s steps. Take in the brick and vine-covered overhang as you bite into your decadent cinnamon roll and sip your rich coffee! Plus, they now have two locations – the original in downtown La Jolla, and a new location at La Jolla Shores! The Living Room is a coffeehouse, lunch place, bakery, and both a wine and a traditional bar. As the name implies, this spot makes you feel right at home, except here you get to enjoy food and drinks (and coffee) without lifting a finger. It even looks out over the water! If you’re looking for a coffee shop with pastries as well as plethora of other desserts, this spot is prime. You’ll see chocolate eclairs, macaroons and amazing cakes like carrot, gluten-free chocolate and three layer mousse. The menu has a wide variety of options, from vegan bagels and veggie-lover omelettes to meat-and-avocado packed sandwiches and ravioli. There’s something extra special about their breakfast sandwiches, especially the Breakfast Club Croissant and Ultimate Bagel Sandwich. The combination of energy-rich carbohydrate and powerful protein really powers you up for the day. If La Jolla has been hit with morning fog, head straight down Girard Avenue to Pannikin. Its fireplace makes it the ultimate cozy place to hit when chilly and its outdoor patio the perfect spot the remaining 95% of the year! This coffee shop is in the design district of La Jolla. If you’re looking for new home decor or just dropped your little ones off at the nearby elementary school, it’s definitely convenient. Pannikin is known for both food and drinks. People come back again and again for their Greek eggs, homemade granola (served with all types of fruit goodness) and pastries, which range from incredibly fluffy muffins to fresh bagels. Beverage wise, whether you order a dirty chai, iced mocha or regular coffee, you can’t go wrong. If you have allergies or simply prefer to avoid dairy, they offer both soy and almond milk too. As well as several roasts of coffee, they have a fantastic selection of teas, which is a pleasant change from most coffee shops. Check Out the Brand New Philz Coffee in La Jolla! This is a classic, old school diner spot from the 1960s. This family-owned cafe has been deemed one of the best retro coffee spots in the nation, and it’s easy to see why. It has a vibe of nostalgia and community. You’ll look to the walls and see memorabilia, like newspaper clippings from when the San Diego Chargers made it into the Super Bowl (which feels like decades ago now!) It’s friendly for humans, dogs, and cars alike: pups are allowed – the restaurant even provides water bowls for them – and there’s a free one-hour parking lot for your car. Drink-wise, basic coffee is always great. If you’re looking to get a little more adventurous, we recommend the decadent caramel-salted latte or heart-warming cafe mocha. Bird Rock Coffee Roasters is a La Jolla gem! 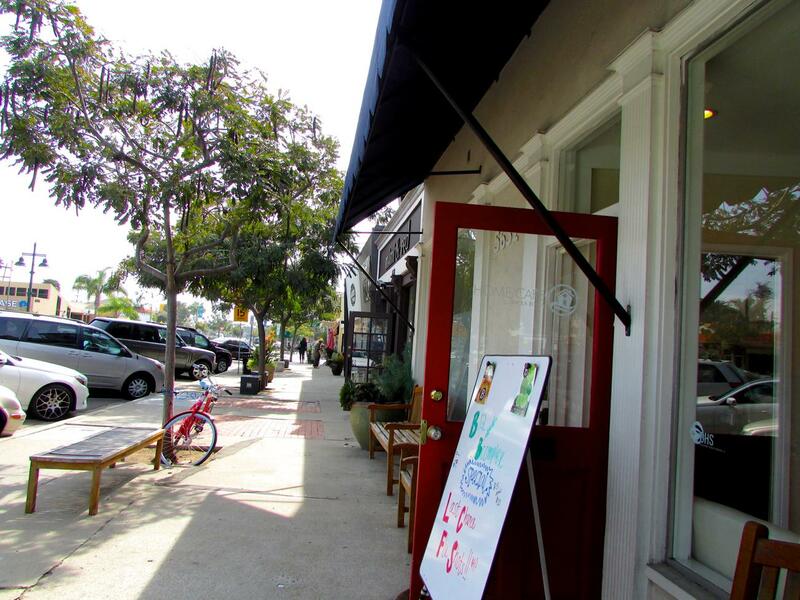 Their flagship location on La Jolla Blvd. is comfortable, spacious, and a perfect spot to curl up and read a book or catch up on work. Known for their ties with international coffee roasters and their dedication to serving green coffee, Bird Rock Coffee Roasters have been upping the coffee game since they opened in 2002. Their drip coffee is delicious, and their variety of international blends is spot on – from their Bird Rock Blend to a traditional French Roast and an organic roast straight from Colombia, you can’t go wrong with any of their roasted coffees. They have two other locations in Little Italy and on Morena Blvd. A relative newcomer to La Jolla, Parakeet Café is our favorite spot for cute Instagram photos and great coffee! With a delicious selection of different toasts (avocado, salmon, and hummus to name a few), oatmeal, and matcha waffles, this is definitely a great place to grab a bite to eat, too. They have a nice selection of iced and hot coffees, including Nitro cold brew (on tap! ), flavored lattes, and espresso. They make it easy to personalize your drink, which is a nice plus when you’re looking for something a little different. They’re located at 927 Silverado Street. Denmark revolutionized the world when, in 1958, it invented the building block that took us all by storm…the LEGO! Years later, this brick inspired one of San Diego’s top attractions, LEGOLAND. Located in nearby Carlsbad, this family-friendly location has you leave in the mood to build something. Though kids and adults alike can find fun here, the park is heavily geared towards children, and you’ll see the main demographic is kids under 10 years of age. 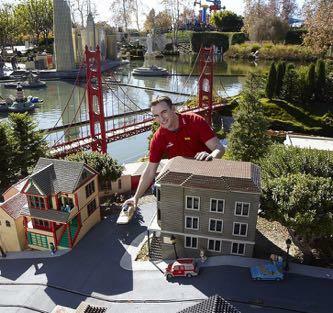 LEGOLAND is full of miniature worlds that have been carefully constructed by top LEGO building masters. As you explore the sites like miniland USA, you’ll feel tall and mighty next to 7 miniaturized areas of the United States that Legoland has created. Look down upon Las Vegas and stand at the same height as New York City! Next, head to the Imagination Zone for a curious, thought-provoking environment. This is where kids can unleash their creative minds and make LEGO creations of their very own. Add some thrills to your day by hopping on one of LEGOLAND’s rides. Each of the rides have different height requirements, so make sure to look at the requirement before going on. This save potential grief for a youngster who waits in the entire line, only to find out upon boarding that he or she cannot get on! LEGOLAND has a full water park and aquarium world connected to it! For an additional cost, you can add tickets to these venues on to your general admission ticket. The LEGOLAND Water Park has play areas for little ones, sweet slides, loop-filled rides and an awesome wave pool! It is the perfect way to help your kids cool off after hot hours spent walking Legoland. The SEA LIFE Aquarium is a great way to combine the greatness LEGOLAND and the pleasures of nearby SeaWorld in one visit! Although much smaller than the vast aquatic park, here your kids can also experiences jellyfish, stingrays, various types of fish and sharks. The earlier you buy tickets, the better. The amount you pay at the park, the day of your visit, will be much higher than if you purchase online a week before. It’s also good to note that this park is incredibly popular and gets especially busy on weekends on holidays. If it’s at all possible, try to come Monday through Friday. If you do attend one of these busier times, be especially conscious of time management. The most popular rides have lines that grow longer throughout the day, so you’ll want to hit those first. Outside food and drink is not technically permitted within the park, however, we will note no security typically inspects incoming bags or backpacks. The wide variety of food within the park makes sure there’s a little something for everyone. You can find snacks that are more upscale than the typical theme park, such as apple fries, and restaurants serve options that cater to many dietary needs. You can find meals that are vegetarian, dairy free, egg free, gluten free and nut free! LEGOLAND loves to honor the holidays with special events and treats. In October, visit the park the few weekends before Halloween for Brick-or-Treat. The park is closed from 5 – 9 pm to make it exclusive for this event where they give out candy, healthy treats and, best of all, LEGOs! During the winter holiday season, come check out Winter Nights & Snow Play. At this event, you can play in snow for free, tube down winter slides and, for an extra cost, go ice skating! For families with young children, LEGOLAND is an ideal full-day destination. Children are guaranteed tired for bedtime and, if you live in the area, can come year round with purchase of an annual pass! Head slightly south of La Jolla and find yourself in Pacific Beach, the neighborhood with the movie-like, casual beach lifestyle. With a reputation for surfing, yoga, beachside bars and hopping nightlife, it’s no wonder it’s the first stop for so many 21st birthday bashes. The wonderful thing about Pacific Beach is that if you’re seeking a high energy, glass-clinking experience, it’s easy to find. If you’re looking for a calmer experience that involves great cafes, meditation and long walks on the beach, it’s easy to take yourself from the heyday of the main street and relax. The always-happening street of this area is Garnet Avenue. On it you’ll find dozens of bars, restaurants, dance clubs, boutique shops and more. On the weekend and Taco Tuesdays, this area is particularly famous for bars that are open until 2 am. There’s a wide variety of bar types and vibes. Some are smaller and have games like foosball, while you’re more likely to find yourself dancing to colorful lights at Typhoon’s or playing human-sized Connect 4 with a margarita in hand at Cabo Cantina. On weekends, brunch is a much beloved tradition here. Many venues offer hand-crafted Bloody Marys and incredibly bottomless mimosa deals. (It has been suggested that the people who most love these brunches are those who were heavily enjoying the bar scene here the night before!) Shopping-wise, this area tends to be quite underrated. Pacific Beach is so popular one assumes most clothing is expensive and oriented towards visiting tourists. However, you can find great quality clothes, sunglasses, accessories and more for reasonable prices. The most popular form of shopping is through the second chance stores. Some examples of these shops include Buffalo Exchange, Thrift Trader and Goodwill. You’ll find incredible deals on great clothes. Sometimes you can find top designer options that even still have the tags on! If that’s not a good deal…we don’t know what is! Northern Pacific Beach is the more calm, more laid back area of PB. 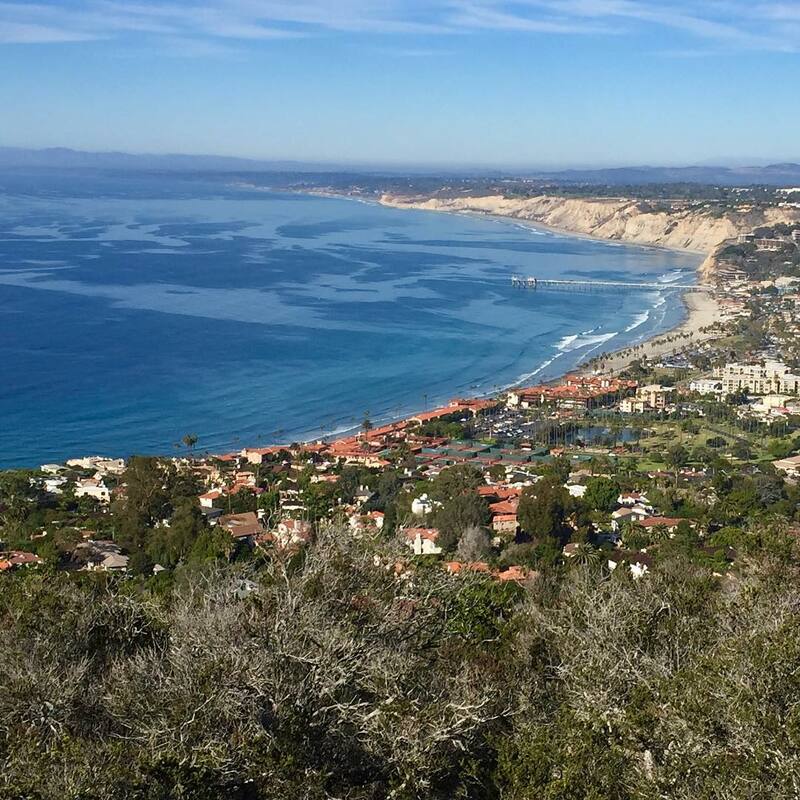 Stroll this area to find decadent San Diego-made coffee, take great pilates classes and, if you stroll far enough North, find yourself arriving back in La Jolla! The coastline at this end of Pacific Beach is also more calm. You’re more likely to see people laying on towels engrossed in books than a group of fraternity men from one of the local schools hosting a volleyball tournament. If you’re visiting, bicycling is the best way to get around because it eliminates the trickiness of parking on a sunny weekend! You can rent or buy equipment at many local venues and the water here is prime for both. Along the boardwalk, along the sand…there are many great runs. Check out the top 4 trails our friends over at Visit PB recommend at their blog: Best 4 Trails to Run in PB. Trying New Food. Specifically? Sushi! Being right by the water, this neighborhood is a mecca for sushi restaurants. They’re all good, but our favorite and recommendation is Zen 5 Sushi. Whether you’ve been practicing for years or are just interested in loosening up, PB allows yogis of all levels to practice and increase their depth. The library offers yoga for free on Tuesdays, the infamous cliffs at Law Street host free sessions every weekend morning and private venues like Corepower Yoga attract many with the popular “hot power infused” classes. Learn more about yoga in PB at Visit PB’s Yoga Page. Slightly south of this area is the laid-back, local vibing Mission Beach & Bay. 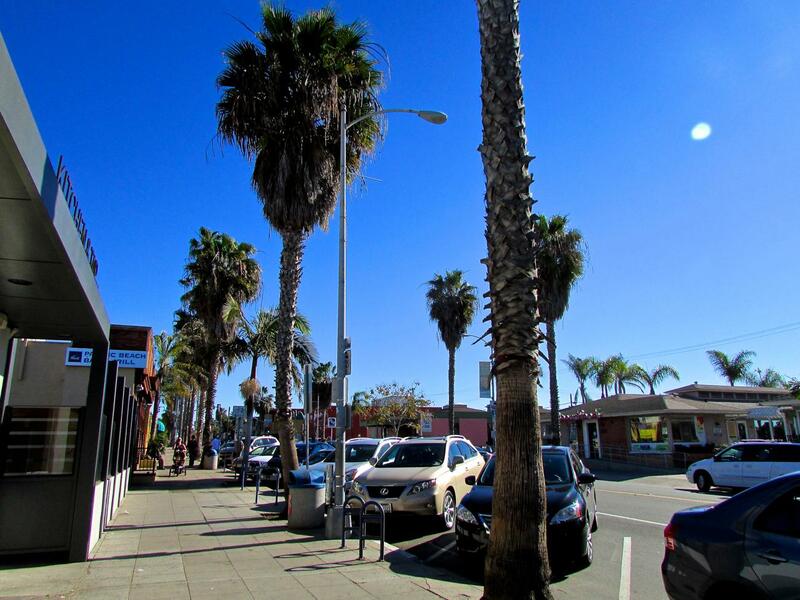 You can incorporate it into your Pacific Beach itinerary by reading more about this area at our Mission Beach & Bay Neighborhood Page. And, hey, want to learn more about the specific beach area of Pacific Beach, like where to find parking? Head to our Beaches Directory and check out our Pacific Beach Page.